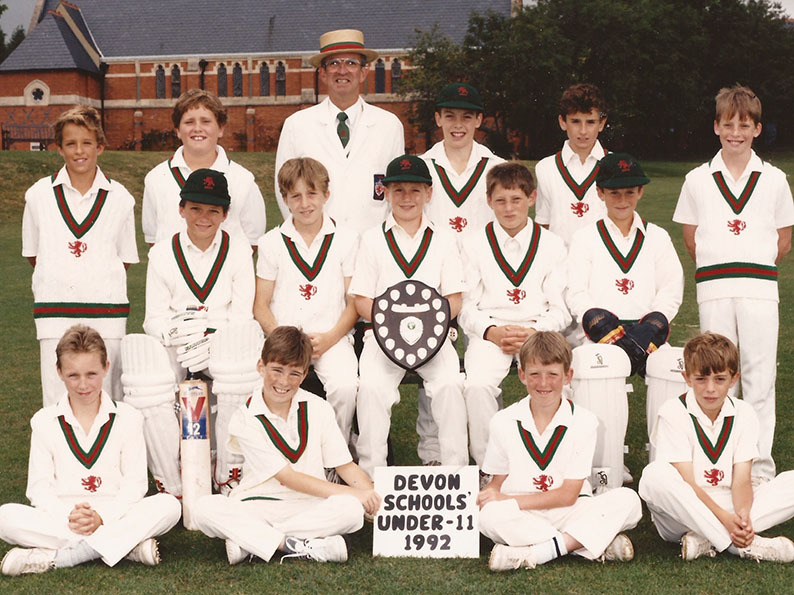 Devon Under-11s in 1992. They are back (left to right): Alex Wallace, Jamie Grey, Russell Knapman, Simon Binns, Andrew Wakeley; middle: Matt Wood, Philip Lewis, Andrew Egford, Dave Manning, Simon Edwards; front: Robert Money, Neil Fairbairn, J Wright, Oliver Bailey. Ted Ashman was born in Trowbridge and educated at Dr Morgan’s Grammar School in Bridgwater, where he played rugby in the 1st XV as a back-row forward. A career in teaching appealed to Ashman who studied at St Luke’s College in Exeter. It was during his time studying at St Luke’s College that Ashman became a devoted follower of Exeter City FC, a passion passed on to son Giles. Ashman taught at Poltimore near Exeter before moving to Blackpool Primary School in Liverton near Bovey Tracey in 1969. He stayed there for the rest of his career, retiring as headteacher in 1999. “As Liverton grew so did the school and my father was part of it for 30 years,” said Giles. “Ted believed in giving children a traditional education and his view was if it was good enough for independent schools it was good enough for his. Another tradition Ted introduced at Blackpool Primary was respect for the monarchy. “Every Friday the pupils would sing the national anthem while the Union Flag was raised,” said Giles. Ashman also ran an annual football tournament at Exeter School for 22 years up to his retirement from teaching. Retirement did little to diminish Ashman’s love for working with young people as he became a volunteer assistant at Exeter School. Ted Ashman was never a serious cricketer himself, but he was an admirer of the morals, values and disciplines of the game, which attracted him to the sport in the early 1980s. His first formal job in youth cricket was as organiser of the Devon Schools’ Cricket Association Softball festivals from 1984 onwards. Ted’s enthusiasm for youth sport was spotted by the late Leslie Belcher, who got him involved in team management. When a Devon under-11s side was launched in 1985. Ashman was appointed manager. He carried on managing sides until 2014, having added the under-10 team to his portfolio in 2003. Ted’s constant companion at county game, tournaments and festivals was his second wife Sally, who looked after the scoring and numerous jobs on top. Ted and Sally met at work and were together for 25 years. Sally died of cancer in 2002. The Sally Ashman Cup, donated in her memory, is awarded to the Devon under-10 or under-11 player of the year. Ted thrived in an administration environment. Other roles he fulfilled included chairman, secretary and treasurer of the Devon School’s Cricket Association, Devon Cricket Board treasurer and chairman of the English Schools’ Cricket Association South West and Wales region for many years. Ashman was also national chairman of ESCA in 1999-2000. During his year in office the Bunbury Cricket Festival was staged in Devon. Exmouth, Sidmouth and Budleigh Salterton were the venues. Two Devonians – David Field and Henry Stead – were selected for the South and South West squad. Ashman attended ESCA executive meetings up to his retirement in September last year. For 15 years up to 2011 Ted organised the annual Devon Youth Cricket awards lunch at a variety of venues around Exeter. The Devon Cricket Board took over awards arrangements from 2012 onwards. Ted and Giles were jointly honoured for their services to youth cricket with commemorative mementos at the 2014 DCB awards evening. The presenter was Craig Overton, who was a member of the 2003 under-10s’ side managed by Ted and coached by Giles. Ted Ashman’s interests outside cricket were speedway racing – latterly trackside at Somerset Rebels matches – and his classic Mini Cooper car.